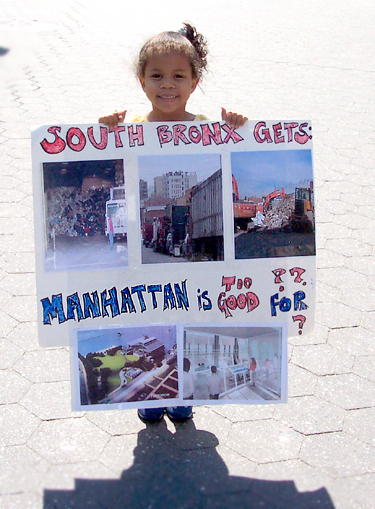 Protesters charged Manhattan "dumps on" poorer neighborhoods in Brooklyn and the Bronx. Raising signs calling for "environmental justice" and shouting "NIMBY no, justice yes," residents of the Bronx and Brooklyn circled the office of State Assemblymember Deborah Glick last week. The protestors, members of the Organization of Waterfront Neighborhoods said they are tired of getting dumped on, quite literally, and want the state to clear the way for a recycling station in downtown Manhattan. The station is intended to ease the burden on the Bronx and Brooklyn, which now take most of the city's trash, and is part of an effort to make the city's solid waste management system fairer and more environmentally friendly. But in the latest development in the city's garbage wars, several Manhattan Assembly members and parks groups want to block the station. Glick, whose district abuts the site, and others said the peninsula simply is not a good place for the recycling station largely because it would impinge on Hudson River Park. Their critics, however, have accused of NIMBYism (not in my backyard) sentiments. "It's Manhattan using its privilege," said Elizabeth Yeampierre , chair of the New York City Environmental Justice Alliance and executive director of UPROSE, a Latino community group based in Sunset Park, Brooklyn. "We want to let Glick know she is in the way. She is in the way of borough equity." As the hours in the current state legislative session dwindle, some organizations and politicians still hope to get this final piece of the Solid Waste Management Plan approved in Albany. Although the City Council approved the plan last summer -- a decision mired in years of debate -- the state must still vote to allow construction of the recycling facility and education center on the Gansevoort peninsula in the Hudson River near 14th Street. The history of disposing waste in New York City is wrought with controversy. For five decades, all residential waste (now estimated at 12,000 tons per day) was taken to Staten Island. After former Mayor Rudolph Giuliani closed Fresh Kills in 2001, city officials scrambled to deal with the 50,000 tons of waste and recyclables collected each day. Meanwhile, most trash has been trucked through communities in the Bronx and Brooklyn where it is transferred to larger trucks that transport it to landfills, many out of state. A 2004 report by a national environmental group concluded that 80 percent of the city's trash collected at private waste transfer stations piled up in just four of the city's 59 community board districts. All were outside of Manhattan, even though that borough creates 40 percent of the city's waste. As garbage trucks tore down city streets in the Bronx and Brooklyn, asthma rates in adjacent neighborhoods skyrocketed, an increase many link to the garbage trucks. The plan proposed by Bloomberg and approved by council last year aims to shift the hauling of waste from trucks to barges and rails. It also would require every borough take care of its "fair share" of waste. Under the plan, the city's waste would still end up in far-flung -- and costly -- landfills. But, according to city officials, the plan would eliminate 5.6 million truck miles annually and reduce the city's carbon emissions as well. The Gansevoort facility alone, they said, would reduce truck trips by 30,000 miles annually. Although City Council passed the entire waste management plan last year, it has not yet been implemented. Some of the marine transfer stations are under construction, while others are being designed, said chair of the City Council's Sanitation and Solid Waste Management Committee Michael McMahon. Some opponents of the Gansevoort facility want the recycling station moved to Pier 76, pictured here. The state government also has approved the entire plan. But because the Gansevoort facility will be within Hudson River Park, it requires a second OK from the governor and legislature. The site is part of a five-mile stretch of open space running from Battery Place to West 59th Street. Opponents of the transfer station said its location would compromise the park, no matter how small the recycling facility may be. Washington Heights Assemblymember Adriano Espaillat has introduced legislation that would allow the station to be built. He said he is optimistic that the legislature will consider the bill before the conclusion of its session this week. "There is never a perfect place and communities never really welcome this type of initiative," Espaillat said. "Many neighborhoods in the city have been relegated as dumping grounds. We must change that paradigm." Bloomberg is pressuring Albany to pass Espaillat's legislation. In a letter sent to every member of the state legislature last week, the mayor stated it is "more than reasonable" to open the recycling station, which will take up two-thirds of an acre in a 550-acre park. 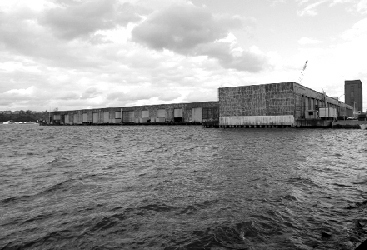 Bloomberg also argues that the Department of Sanitation studied other sites for the marine transfer station, including those being proposed by opponents, and none were suitable. Pier 76 especially, the letter states, is "ill-suited" for public use because roads and ramps would create narrow park spaces that would bring about safety concerns. Its proximity to the Lincoln Tunnel would also complicate the site's access. The reactivation of the recycling marine transfer site at Gansevoort - where a station had operated until 1991 - would free up space currently taken up by recyclable materials at another waste transfer station on 59th Street. That, in turn, could further relieve pressure on the transfer stations in the Bronx and Brooklyn. In particular, though, supporters of the solid waste plan fear any change in it -- such as moving the recycling facility from Gansevoort -- could derail the waste management plan, allowing trash to continue to pile up in less affluent communities outside of Manhattan. "That part of the plan cannot go forward and you will have a domino effect," McMahon said. In an attempt to protect the waste management plan, the City Council endorsed the reactivation of the Gansevoort station by a vote of 48 to 3 last week and urged the legislature to approve the bill. Those voting against the measure were Councilmembers Gale Brewer, Daniel Garodnick and Jessica Lappin, all of which are from Manhattan. The plan's supporters also want the legislature to act before the end of the session, claiming the issue could be placed on a back burner and ultimately jeopardize the entire plan. "If it's not passed now... it's potentially a really missed opportunity," said Gavin Kearney, an attorney with New York Lawyers For The Public Interest, which works with the Organization of Waterfront Neighborhoods. "The push that we're getting from opponents to study alternative sites could really kill it." Opponents of the facility, including Friends of Hudson River Park, the Coalition to Protect Our Parks and Manhattan assembly members, Glick, Richard Gottfried and Linda Rosenthal, said the Gansevoort site poses an array of problems. In a statement, Glick said, "It is unacceptable for the mayor to tout his environmental vision for the future, while his administration is seeking to dramatically reduce critical parkland in one of the most park-starved communities in the city." Matthew Washington, the deputy director of the Friends of Hudson River Park, said the station could be built on other sites on the West Side -- areas that would not threaten parkland. A study by the groups supports a combined transfer facility at Pier 76 near 36th Street. The pier, the current site of the Manhattan tow pound, is more than twice the square footage of the Gansevoort and 59th Street sites combined, according to the study. Park advocates have said their opposition is not a case of NIMBYism. "We think it's important for each borough to handle its own waste," Washington said. But, he added, "One of the things that's important to us is not alienating parkland."